In Week 1 you explored how rain forms when air cools, the rate of condensation becomes faster than the rate at which water is evaporating and cloud droplets form. If these droplets get big enough they become rain – or snow, sleet or hail. You’ve previously looked at this type of rainfall in some detail. 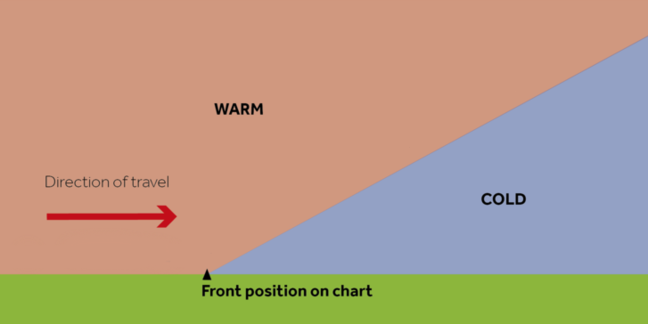 Frontal rain is found where warm air meets cold at the cold and warm fronts in a depression (Figure 1). Convection is the term given to warm air rising. We’ve seen convection occurring in polar continental and maritime air masses, where the air is warmed from beneath as it travels towards the equator. 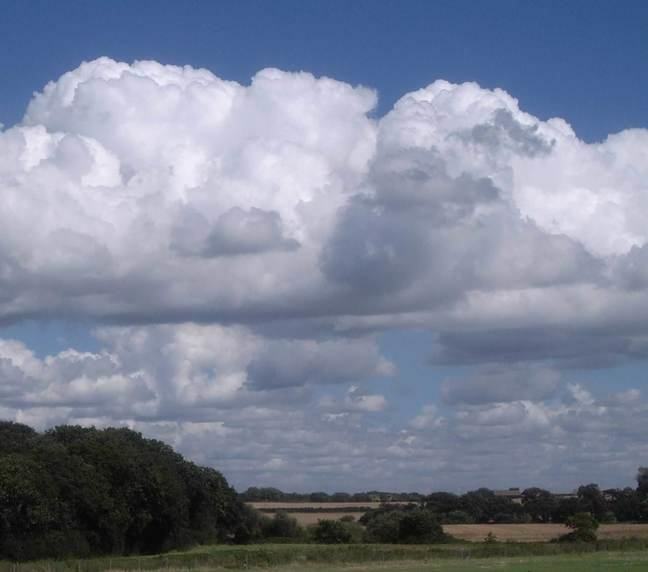 More generally, convection is normally marked by cumulus clouds which billow upwards as the air rises. The base of such clouds is usually flat, marking the level where temperatures are cold enough for more condensation to be going on than evaporation. Extreme convection can be found in thunder clouds (towering cumulonimbus), which can reach all the way up to the top of the troposphere, the lowest 10km or so of the atmosphere in which our weather is found. 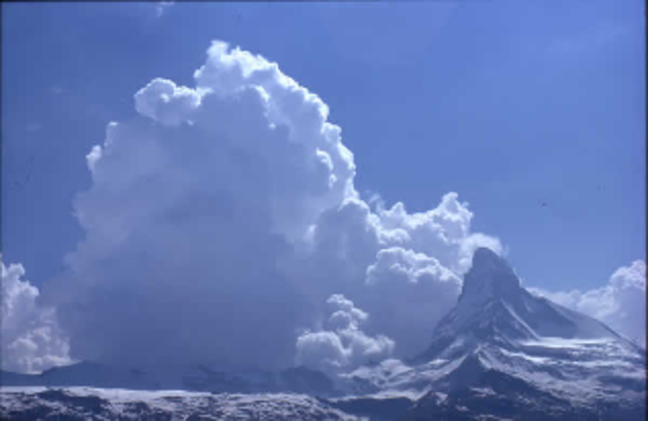 As air can’t rise into the stratosphere above, the top of the cumulonimbus cloud spreads out, giving it a characteristic ‘anvil’ shaped top (Figure 3). Such convection can occur where the ground has become particularly warm, heating the air above it. It is particularly associated with the Tropics, characteristically giving heavy rain in the late afternoon. 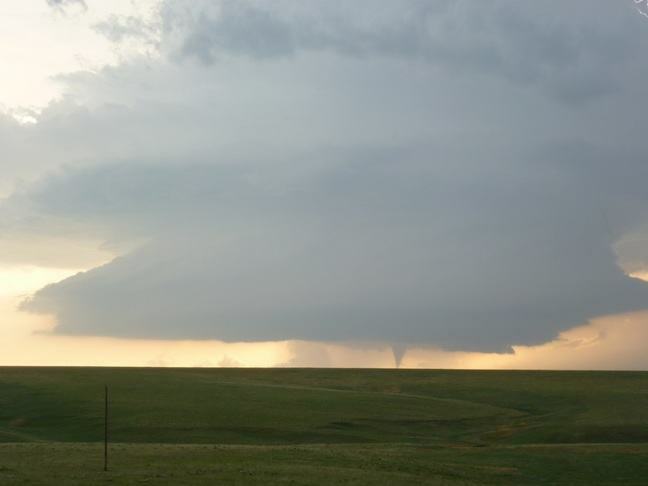 Cumulonimbus clouds can give heavy rain, hail, thunder lightning and sometimes tornadoes (Figure 4). When air is forced to rise over land, particularly higher ground such as hills and mountains, it cools as the pressure falls. Dry air cools at 9.8°C per 1000m it rises. Eventually, the air can cool enough for cloud to form (Figure 5). The cloud droplets may get big enough to fall as rain on the upstream side of the mountain. If that happens, then, when the air has passed over the top of the mountain and starts to descend, and warm, on the far side, there will be less water to evaporate back into the air. The air will end up drier than it was on the upstream side of the mountain. This can produce ‘rain shadow’, an area of land downstream from some mountains (for the prevailing wind direction, in the UK, this would be to the east) where there is noticeably less rainfall. The Tibetan Plateau is so dry because it is in the rain shadow of the Himalayas. Orography can enhance frontal or convective rain; for example, we have explored how polar maritime air, the prevailing air mass in the UK, brings convective rain to the Atlantic. As the air reaches the UK and rises over the land, the precipitation is increased. 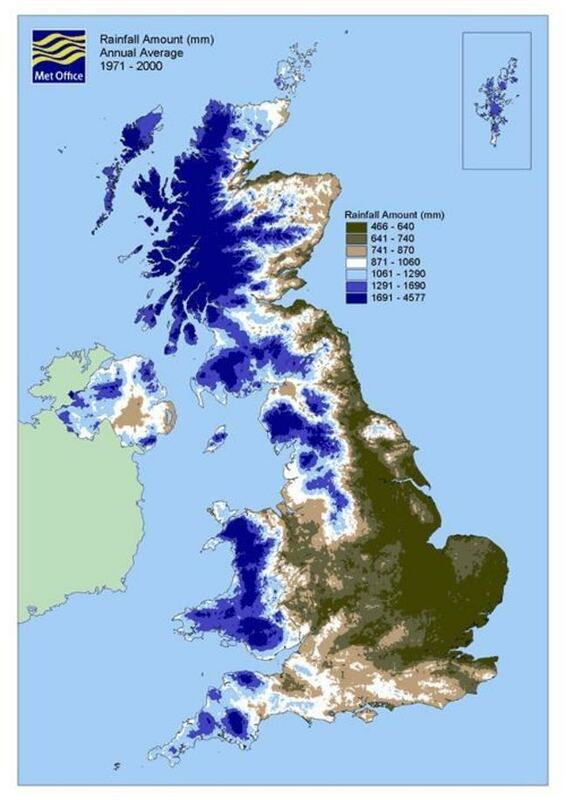 The precipitation map above (Figure 6), shows the rainfall ‘climate’ (averaged over 30 years) of the UK. With prevailing westerly winds, there is clearly more rain on the western side of the country, enhanced by the mountains of Wales and Scotland and the English Pennines. As well as being drier on the downwind side of the mountains, it can also be warmer. Remember that water releases heat into the atmosphere as it condenses and takes it up as it evaporates. If there is less water in the air on the downwind side, then there is less to evaporate and not all the heat that was released on the upwind side will be taken up again. This is known as the Föhn Effect. The onset of a Föhn is generally sudden. For example, the temperature may rise more than 10°C in five minutes and the wind strength increases from almost calm to gale force just as quickly. Föhn winds occur quite often in the Alps (where the name originated) and in the Rockies (where the name chinook is used). 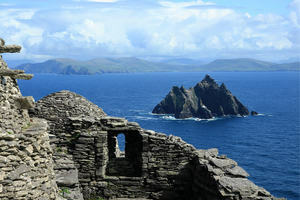 They can also happen in eastern Scotland and over eastern parts of New Zealand’s South Island. In addition, they occur over eastern Sri Lanka during the south-west monsoon. Where there are steep snow-covered slopes, a Föhn may cause avalanches from the sudden warming and blustery conditions. In Föhn conditions, the relative humidity may fall to less than 30%, causing vegetation and wooden buildings to dry out. This is a long-standing problem in Switzerland, where so many fires have occurred during Föhn conditions that fire-watching is obligatory when a Föhn is blowing. However, clouds don’t just need water vapour to form – they also need cloud condensation nuclei (CCN) for the water droplets to condense on to. Clouds can’t form in clean air. This is the idea behind ‘cloud seeding’ to control when and where it rains, and some Climate Engineering proposed solutions to climate change. You can read more about cloud seeding in this PDF on the Metlink website. 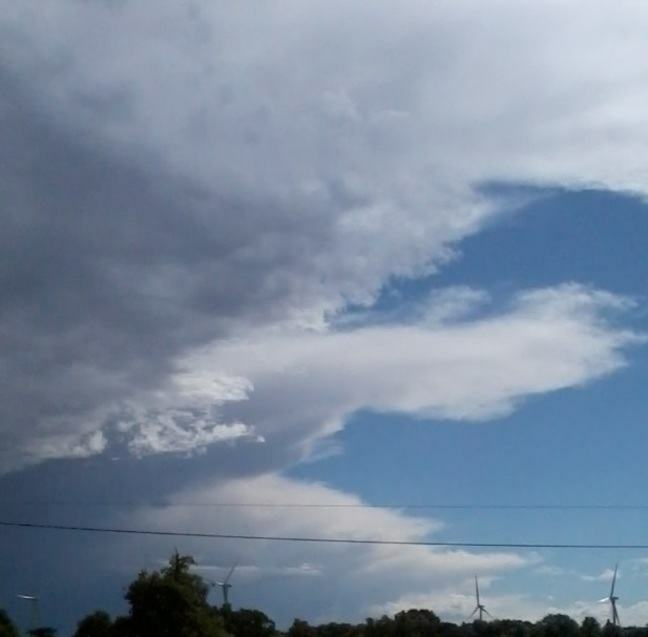 If you would like to read more about the different cloud types, you can find more information on Metlink website.